Good afternoon to her worship the Mayor of Hamilton, chairperson Rob Pascoe and Councillors, and the CFO, CIO, General Managers, Group Accountants, Managers, Directors and Advisors. I’m speaking today as a member and spokesperson of Cycle Action Waikato, with me is Ashley Hooper of Hamilton Urban Blog. Coming up in the City Local Area plan are plans to make the CBD more pedestrian friendly. Part of the plan is easier access to Wintec, CBD and the Transport Centre. A critical element of this is access for cyclists and as such we’re proposing the repairs include separated cycle lanes. The repairs include the kerbs being removed, footpaths repaired, all the trees being chopped down and WEL networks replacing infrastructure at the same time. Including cycleways in these repairs will be of a very similar cost and it is essential the work is done now rather than a very costly retrofitting being placed on ratepayers later. 597 more people,or 15%, cycle to work daily (1,719) than take the bus (1,122) according to the 2006 census. In the 2013 census this increased to 97% (1761) more people (3570) people cycling than (1809) taking the bus. Yet in the annual plan, for 2014/15 the sums allocated for bus stops, transport integration and minor improvements are $1.58M. Road resurfacing and replacement of the road base are allocated $5Million. Nowhere is cycling specifically allocated for yet the more people cycling, the cheaper it is for Hamilton residents, ratepayers etc. In that spirit it is also essential that pedestrians and cyclists are free of each other, as well as of vehicles. Anglesea Street is designated as a City Living Precinct, the definition of which is ‘an area with the greatest potential for transformation’. 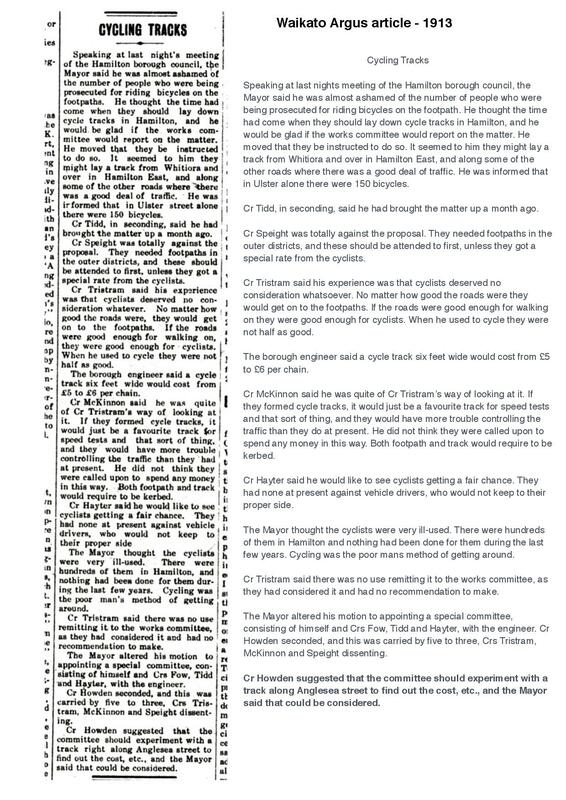 Now one of the documents you have in front of you is an article from the Waikato Argus newspaper, published in 1913. 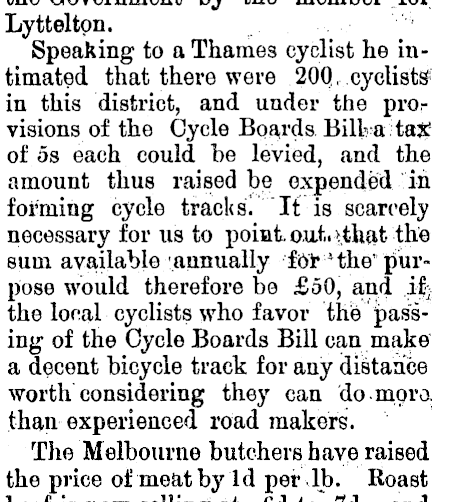 Over 100 years ago in 1913, Hamilton City Council was looking at doing exactly what we’re proposing now, separated cycleways along a stretch of Anglesea Street. Please don’t let another young man or woman be standing here, in 2114, another 100 years on, pleading for a scrap of decent cycling infrastructure. This project is over 100 years in the making and its time it went from committee stage to action.